First Born Son and girlfriend have just arrived back from ten days of Club Med Phuket, both are looking very tanned with FBS even sporting a bit of a beard. The pair met up with GF's family there and MB is waiting for the "meet the parents" stories, so far not many amusing anecdotes happening, probably due to the pair having flown most of the night and arriving 7:30am this morning. Some gifts have surfaced with GF's Mum sending MB a set of beautiful lacquerware bowls decorated with cherry blossom and a "chop" with her name in Romaji on it. Very thoughtful gifts which MB will truly enjoy using. GF also had her Mum stock up on some items which she misses from home in Japan. Various medicines and hair products mostly, one item which tickled MB was the personal battery powered mosquito repellent. 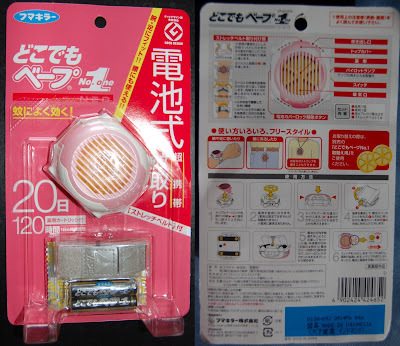 MB is very familiar with mozzie zappers which one plugs into a power point at home to keep the mozzies at bay, however the Japanese have gone one step better and produced a portable version which the manufacturers recommend one straps onto a limb, or around one's neck, or even over the fly of one's trousers (see picture). When FBS first saw a Japanese tourist in Phuket wearing one on his lower leg he thought it was an ankle cooling fan.